Join well known Author and Journalist Peter Fitzsimons as he brings the whole historic event of the Eureka Stockade to life in his latest book, Eureka The Unfinished Revolution. In 1854, Victorian miners fought a deadly battle under the flag of the Southern Cross at the Eureka Stockade. Though brief and doomed to fail, the battle is legend in both our history and in the Australian mind. Well known author and journalist Peter Fitzsimons brings the whole historic event to life in his latest book, Eureka: The Unfinished Revolution. Peter Fitzsimons discusses A simpler time. Peter FitzSimons reads from Charles Kingsford Smith and Those Magnificent Men. 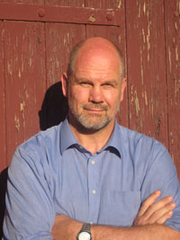 Peter John FitzSimons AM (born 29 June 1961, Wahroonga, New South Wales) is an Australian journalist and author, based in Sydney. He is a former radio presenter and national representative rugby union player. Peter FitzSimons is currently considered a "single author." If one or more works are by a distinct, homonymous authors, go ahead and split the author. Peter FitzSimons is composed of 4 names. You can examine and separate out names.